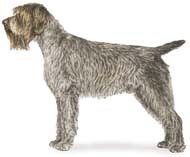 Though the origin of the Wirehaired Pointing Griffon is Dutch, it is regarded as a French breed. This is due to the fact that a major portion of the development of the breed took place in France. The WPG is particularly adapted for swampy country, where its harsh coat is excellent protection. The Griffon is an excellent swimmer and retriever. The breed's wiry coat requires attention to grooming to keep it healthy. This intelligent dog is easy to train and very willing to please. They are outgoing dogs who are loyal and trustworthy. Medium sized, with a noble, square-shaped head, strong of limb, bred to cover all terrain encountered by the walking hunter. Movement showing an easy catlike gracefulness. Excels equally as a pointer in the field, or a retriever in the water. Coat is hard and coarse, never curly or woolly, with a thick undercoat of fine hair, giving an unkempt appearance. His easy trainability, devotion to family, and friendly temperament endear him to all. The nickname of "supreme gundog" is well earned. Size 22 to 24 inches for males, 20 to 22 inches for females. Correct size is important. Oversize to be severely penalized. Proportion Slightly longer than tall, in a ratio of 10 to 9. Height from withers to ground; length from point of shoulder to point of buttocks. The Griffon must not evolve towards a square conformation. Substance medium, reflecting his work as an all-terrain hunting dog. The head is to be in proportion to the overall dog. The skull is of medium width with equal length from nose to stop and from stop to occiput. The skull is slightly rounded on top, but from the side the muzzle and head are square. The stop and occiput are only slightly pronounced. The required abundant mustache and eyebrows contribute to the friendly expression. The eyes are large and well open, more rounded than elliptical. They have an alert, friendly, and intelligent expression. Eye color ranges in all shades of yellow and brown. Haws should not show nor should there be protruding eyes. The ears should be of medium size, lying flat and close to the head, set high, at the height of the eye line. Nose Well open nostrils are essential. Nose color is always brown. Any other color is a disqualification. Bite scissors. Overshot or undershot bite is a serious fault. Neck rather long, slightly arched, no dewlap. Topline The back is strong and firm, descending in a gentle slope from the slightly higher withers to the base of the tail. Body-Chest The chest must descend to the level of the elbow, with a moderate spring of rib. The chest must neither be too wide nor too narrow, but of medium width to allow freedom of movement. The loin is strong and well developed, being of medium length. The croup and rump are stoutly made with adequate length to favor speed. The tail extends from the back in a continuation of the topline. It may be carried straight or raised slightly. It is docked by one-third to one-half length. Shoulders are long, with good angulation, and well laid back. The forelegs are straight and vertical from the front and set well under the shoulder from the side. Pasterns are slightly sloping. Dewclaws should be removed. Feet are round, firm, with tightly closed webbed toes. Pads are thick. The thighs are long and well muscled. Angulation in balance with the front. The legs are vertical with the hocks turning neither in nor out. The stifle and hock joints are strong and well angulated. Feet as in front. The coat is one of the distinguishing features of the breed. It is a double coat. The outer coat is medium length, straight and wiry, never curly or woolly. The harsh texture provides protection in rough cover. The obligatory undercoat consists of a fine, thick down, which provides insulation as well as water resistance. The undercoat is more or less abundant, depending upon the season, climate, and hormone cycle of the dog. It is usually lighter in color. The head is furnished with a prominent mustache and eyebrows. These required features are extensions of the undercoat, which gives the Griffon a somewhat untidy appearance. The hair covering the ears is fairly short and soft, mixed with longer harsh hair from the coat. The overall feel is much less wiry than the body. The legs, both front and rear, are covered with denser, shorter, and less coarse hair. The coat on the tail is the same as the body; any type of plume is prohibited. The breed should be exhibited in full body coat, not stripped short in pattern. Trimming and stripping are only allowed around the ears, top of head, cheeks and feet. Preferably steel gray with brown markings, frequently chestnut brown, or roan, white and brown; white and orange also acceptable. A uniformly brown coat, all white coat, or white and orange are less desirable. A black coat disqualifies. Although close working, the Griffon should cover ground in an efficient, tireless manner. He is a medium-speed dog with perfect coordination between front and rear legs. At a trot, both front and rear legs tend to converge toward the center line of gravity. He shows good extension both front and rear. Viewed from the side, the topline is firm and parallel to the line of motion. A smooth, powerful ground-covering ability can be seen. The Griffon has a quick and intelligent mind and is easily trained. He is outgoing, shows a tremendous willingness to please and is trustworthy. He makes an excellent family dog as well as a meticulous hunting companion. Nose any color other than brown. This standard was approved October 8, 1991, effective November 28, 1991.